Yeah the summers of 2010 2011 and 2012 were all about as bad as you can get in a temp and dewpoint combernation around here pure nastyness.at least in 2012 instance we had the mighty super derecho end ofbjune those still a night mare as far as Temps and dew points go that summer. A legitimately terrifying storm, literally changed the landscape in ways that are still evident today. I have no idea how any of our trees survived that wind...lasted over 30 minutes and some areas gusted over 100mph. Then there was another massive storm on September 8th that year, winds just as strong but less damage since the weaker trees were mostly taken out. That said, the late July/early August 2010 outbreaks take the crown around here. As of now, that's the only time I can recall legitimately fearing for my safety in a thunderstorm, even inside my house. I'll never forget the power going out, five minutes before the first gust of wind. I opened the back door, and remember hearing what sounded like low flying jets in the distance (DCA air traffic flies low/overhead all the time, so that's what I figured). The roar slowly got louder over the next minute or so...much louder than a jet or chopper. So, I looked towards the storm, at which point I realized it was the sound of the wind roaring through the woodland trees, still easily over 1/2 mile away..debris soaring high up in the air. So I sprinted back to the door, and right as I got there, the wall of wind hit like a ton of bricks. Large trees literally started exploding, almost as if they'd been laced with dynamite or something. I was legitimately terrified, screaming and cussing my a** off, yet almost unable to hear myself over the roar of the wind. Still get chills when I think about that storm. This was the second thunderstorm in that sequence of systems that week. This is still nothing compared to how intense it was around here and to the N/NE, but still an impressive video. Microburst moves in at ~ 1:20 into the video. that was insane lighting thunder as well lighting thunder slimutarliy. Are you sure we don't live in a parallel universe together? We've been experiencing a series of incredible storms this evening. 65*, Amazing displays of lightning and thunder and massive downpours. A tornado warning in effect south of me. A tornado has been spotted on the ground. Flash flooding occurring, windy as hell. The past 3 days we've had very heavy fog all day. Today on the road, visibility got down to about 40 yards. Crazy weather for winter in Texas. More like May. Tornado warning currently in force in SE Tarrant Co. - NE Dallas Co. it's a rain wrapped tornado and they're telling everyone east of me to take shelter and get off the roads. 70mph winds currently and quarter sized hail. This has been a torch for the record books. Lows will be warmer than average highs for this time of year. the never ending torch pattern it seems lol bring on the solar minimum and decaying solar winds in the next few years.then it a wrait and see on what and how cycle 25 behaves no doubt it will be a weak cycle the question is how weak the next few cycles will determined how severe this minimum will be. Yeah, we know how this works. Once solar wind/geomag backs off, photochemical processes in upper atmosphere improve thermal gradients/wavetrain for -NAO, and our winters cool substantially, often regardless of ENSO. Next winter possibly borderline, but either 2018/19 or 2019/20 are almost guaranteed to be epic. Could have lowest solar wind integral in over a century. Well... I am throwing in the towel for Winter 2016. Looking over the weeklies show that at best, we might get a shot of cold at the end of Jan and then last half of Feb. To add to this gut punch, seeing that that the snow chances are not exactly great. I can hope though that we see a decent severe season seeing how the pattern might flip with cold. I'm still thinking we see a snowstorm or two in FEB/MAR. That's the heart of nor'easter season, and the polar state will be transitioning. It can absolutely unload here in March, too. Over the last decade in the DC suburbs, 8/10 marches featured measurable snowfall, and 10/10 Februaries featured measurable snowfall. - Moderate to significant March snowfalls: 2008/09, 2012/13, 2013/14, and 2014/15. - Light March snowfalls: 2006/07, 2007/08, 2010/11, and 2015/16. - Snowless Marches: 2009/10, 2011/12 (2009/10 featured no snowfall after 2/10, despite being our snowiest winter on record). All years had measurable snow in February. - Years with *moderate or significant* snowstorms in February: 2006/07, 2007/08, 2009/10, 2013/14, 2014/15, and 2015/16. So, 7/10 winters over the last decade featured February or March as the *snowiest* month. Interesting to note that, while three years featured January as the snowiest month (2010/11, 2011/12, 2015/16), there are no years that featured December as the snowiest month. April is an interesting case as well. So over the last decade, 7/10 Aprils featured at least a trace of snow, and 4/10 featured accumulating snowfall, including each of the past three years. It should be noted that some of these April snowfalls occurred during powerful frontal passages, (2007/08, 2011/12, 2012/13, 2015/16), as opposed to coastal development, and historically these frontal events deliver April snow more frequently than coastal lows. However, boundary-riders accounted for 2006/07 and 2014/15, and legitimate coastal cyclogenesis accounted for 2013/14, and there was a another coastal system in 2015/16 as well, about a week after the April fools day cyclone/frontal passage. The biggest stuff almost always waits until the later portions of winter. Would be fairly unusual if both February and March are snoozefests. For context, summaries of the last 10 winters in the DC area. 2006/07: No snow until Feb.
- Blowtorch and *completely* snowless until early/mid February, before the regime flipped. Not even a trace of snow in November, December, or January. Multiple wintry events during the Feb/Mar window, including the great Valentine's Day cyclone, which dropped 6" of pure sleet here. Also, that powerful Arctic front mid-month, followed by the most intense snow squalls I've ever experienced here in late February, as well as additional accumulating snows in early/mid March and early/mid April. - A mostly warm winter throughout, but a multitude of powerful cyclones threw down several strong frontal boundaries and subsequent anafrontal coastal riders, some of which delivered light snowfall to the area. No measurable snowfall in November or December. The highlight of that winter was the early March frontal passage, which delivered extremely high winds (BWI, DCA, and IAD all gusted between 70-80mph) followed by blinding snow squalls. 2008/09: Cold, but mostly snowless until Mar. Epic New Years windstorm. - Frigid at times, but largely snowless until the blizzard in March, which dropped 6" here. There was a minor clipper system in January that dropped ~ 1", and several severe wind events, the most damaging one occurring just after New Years, one in February, and two in March. April frontal passage featured convective snow squalls. 2009/10: Record breaking, epic Dec/Feb, torch Nov/Jan/Mar. - After a furnace November, three massive blizzards occurred, one in December and two in February, along with moderate snowfalls in every month except November and March. That incredible 12 day stretch from Jan 29th to Feb 10th was the highlight of the winter, featuring 4 snowstorms that dropped 5+ feet of snow in many areas. The February 10th blizzard was a beast, featuring convective snow bands and absolute white-out conditions once the sleet/zr changed to snow. A line of snow-thunderstorms developed along the airmass boundary, and produced 50-70mph gusts area wide along with extreme snowfall rates, almost as extreme as the February 2007 snow squalls. That said, winter abruptly ended after the blizzard on February 10th, which was/is perhaps the most anticlimactic finish to a winter in modern history here. 2010/11: Mostly snowless Nov/Dec, active Jan through Mar. - Blowtorch November, including overnight severe squall line and Baltimore tornado. Cold/snowless December, including a narrow miss on the Boxing Day blizzard, after models had it nailing us just 48hrs out. This was followed by the "commutageddon" blizzard in January, which delivered a quick 6-12" of chowder with temps at/above 32 degrees, prolific thunder/lightning, and high winds, the combination of which knocked out power to many hundreds of thousands in the DC area alone. Walking outside, it was hard to decipher between lightning and transformer explosions. There was also an epic cyclone in February, which delivered extremely high winds to the area, the likes of which I have not seen surpassed during the winter, said March 2008, and have yet to be matched since. Additional light snowfalls occurred in February and March. 2011/12: Horrible winter, snow event in Oct, snowless Nov/Dec, still mostly shoddy thereafter. - Torch for the ages. Snow event of 2-4" in October, massive torch onward from there, into early January. Strong frontal passage just after New Years, several powerful fronts in January and February delivering snow squalls/light accumulations, blast furnace in March, then a final hurrah in April. 2012/13: Mostly snowless until Mar, blowtorch until mid-Jan.
- Crappy winter, largely snowless until March. Horrible bust March 5th-6th, with 8-12" forecast by models/NWS, end result was a warm snow that failed to accumulate. Minor 2-4" snowfall occurred on March 28th-29th, one more very light snow in early April. A powerful wind event occurred in mid-March as well. 2013/14: Frigid, snowy, w/ ~ 80% of snowfall in Feb/Mar. Amazing winter, started in November, lasted through April, with a total of 17 winter storms. Huge Arctic blast in January, amazing blizzard in February, dropped about 18" in 8hrs, before the warm nose flipped us to mostly sleet/zr. Another powerful storm in March, dubbed the Saint Patricks Day blizzard, dropped 8-12" of powder. Snowpack almost all winter, another epic windstorm in March, followed by another accumulating snow event in early April for much of the area. 2014/15: Mostly snowless until amazing Feb/Mar. - November was cold with a light, sloppy snow event, followed by a warm/snowless December. Clipper storm in January dropped a modest 2-4" of powder, followed by frigid temperatures. That said, the real action started in mid-February. Massive Arctic front blew through on the eve of Valentine's Day, featuring intense convective snows (up to 4-5" in ~ 45 minutes) and hurricane force gusts that lasted through the night. Temperatures plunged from the low/mid 30s, down to zero/below zero in 4hrs. A few days later, 4" of powder fell with temperatures around 10 degrees, and a few days after that, yet another 6" of snow fell, followed by 1/4" to 1/2" of zr, then another Arctic plunge. Then in early March, another 1/4" to 1/2" of zr fell, followed by 5-8" of snow on March 5th. Winter took a hiatus thereafter, until a slew of early April frontal passages, before the flip to blowtorch in late April. 2015/16: Snowless until mid-Jan blizzard, episodic snows in Feb/Mar. Warmest winter on record in some areas. - Absolute furnace in November/December, records fell just about everywhere. Snow squalls in mid-January, very light snow event January 19th-20th, followed by an amazing blizzard in late January. Another 4" of snow/ice in February, light snowfall in early March, followed by another epic torch until a powerful windstorm/frontal passage around April fools, and a light snow event on April 9th. So, as can be seen, it's not unusual for winters here to remain anemic into February, before turning on thereafter. Whether or not that happens this winter remains to be seen, but I'm reasonably optimistic that February will deliver at some point, perhaps March as well. The 12z ECMWF is depicting a southeast screamer Sunday and Monday, with gusts up to 60mph in the DC area verbatim. It's been several years since we've had one of these. Used to be much more frequent IIRC. I'll be lolling in a bath of hot water tonight. I don't think our winter is over yet. I'm waiting for more cold rain, perhaps some of the frozen stuff, dare I say so ? Wind advisory for east winds gusting to 50mph tonight and tomorrow, along with 1-2" of rain. Unusual to have strong winds out of that direction in January when it's not snowing. Actually, we had 50mph due *east* winds in awhile, actually. Last year's blizzard was more of a northerly, as was snowmageddon 2010. Hurricane Irene was N/NW, Sandy was W/NW. So, there's a good chance the trees are "out of practice", so to speak, and with all the rain coming, I have to wonder if we won't see some tree damage. Have to go back to hurricane Isabel, I think. Trees are used to westerly winds here, so obviously they didn't handle 70mph easterlies very well. Knocked power out for over a week, and even snapped a bunch of power poles on MacArthur Blvd with the force of the wind alone. Were under wind advisories as well. 25-30 sustained winds with gusts to 40mph. High was 63, low of 40. More sun tomorrow but wind dies. Where the hell is winter ? With all this wind Phil, are there ANY trees left ? Haha. We've been able to avoid any high wind warning caliber events so far, but obviously that's unlikely to last as we head into March/April. Either way, those spring storms are usually westerly events, and the trees here handle westerly winds very well given they're used to it. Structural damage usually starts before tree damage when winds are westerly. East/Southeast winds are much more problematic. Even 35mph winds from that direction have caused problems here in recent years, and with 1-3" of rain falling over the next 24hrs, this could be very problematic it gusts surpass 40mph (which looks like a safe bet at this point). Where the hell is winter ? We're still waiting for it in Texas. Any chance we'll have one ? A few cold shots and northers in Feb/Mar down there, but probably nothing overly significant without a stronger subtropical jet stream, at least in my opinion. Up here, might be different. This has the "feel" of a winter that'll dump a bunch of snow last minute, in February or March. Niña winters love to throw down a blizzard or two, right as people start looking forward to spring. Years like 2008/09 and 1999/00 come to mind.. Sounds like a freight train out there. Amazing we still have power. Heard a huge tree crash somewhere in the woods. Several close lightning strikes today. Over to sleet here during heavier precip bands, drizzly mist in between bands. Puking snow in the western suburbs as the profile cools. Actually a much colder thermal profile than modeled, so maybe we switch over to snow later tonight. Mountains are being dumped on. Winds gusted to 55mph in Georgetown, up to 65mph at Snowshoe, to 47mph @ DCA. Many limbs down here as the trees aren't used to easterly winds of this strength. I could see a bunch of transformers going off last night. Well, I guess it's all over with but the shouting. May as well start planning where I'll put the rose bushes late Feb. I just can't believe how many trees go down near you. Hard to believe there's any forest left on the east coast. Lol, we have a lot of trees. My neighborhood actually sits in the middle of a old woodland, and most of the trees are Tulip Poplars over 100yrs old. These trees mark the first step in forest succession around here, and phase two is beginning in some areas, which is marked by the decline of the Tulip Poplars and the rise of hardwoods like Oak, Sycamore, and Beech. So Phil, what is severe season going to look like? Well it can't possibly be worse than last year's. [knock on wood]. Will depend on where ENSO/tropical convection goes. One thing that's for sure is we'll have the +QBO, and a weak to nonexistent ENSO signal. Watching the IO domain too..right now it's cold and quiet, which typically favors early season action. From @Terpweather on twitter. All winters having featured 1" or less snowfall @ DCA through 1/25. In the vast majority of cases (and in all weak ENSO years) the majority of seasonal snowfall occurred in February/March. Some -ENSO years, including 1889/90, 1959/60, etc, featured no snowfall at this point in time, and wound up with above average snowfall by winter's end. Front blowing through here, gusts to around 35mph ongoing. I'd love to spend a few years @ Snowshoe WV. Sustained at 52mph, gusting to 68mph there currently with occasional snow squalls and whiteout conditions. Wind advisory out for 50mph gusts. Might be a loud afternoon as the mixing layer deepens w/ downslope warming under CAA. Martinsburg at 53mph, Wintergreen at 57mph so far. As some have already noted, watch the February 5-10 window closely. Timing is absolutely crucial here, but should everything come together properly, we could have a significant snowstorm of blizzard on our hands. Fred might have to cancel his business trip. 06z GFS would be a high wind warning event for the higher elevations along/west of the Blue Ridge. Could see places like Snowshoe WV surpassing 80mph verbatim. A coworker and I removed a sickly tulip poplar from our property today, but before doing so we measured it at 170ft. We double checked just to be sure, and it's not even the biggest tree on the property. It's amazing to me how huge these guys get. I know most people claim they have weak wood, but in all my years here, they seem to weather storms the best of all other tree species. Their storm survival stategy seems to be to shed larger peripheral limbs earlier on, leaving the trunk and central structure intact. I have never seen a tulip poplar uprooted in a storm, though over time the biggest trees have been degrading. Meanwhile, I'd say 80% of the tree issues we handle are related to softwoods like White Pine, Douglas Fir, and various Spruces as well as Oaks. The softwoods are always snapping at the base or somewhere halfway up the tree, while Oaks seem to uproot when they get big. Radar looking pretty good. Maybe 1-2" of paste over 4hrs? That's a huge tree. We don't have many of the poplar species around here. Had a brief period of half dollar flakes earlier. Now moderate snow w/ tiny flakes, about 1/2" so far. Finished with under an inch of wet snow. Clinging to all the trees so it looks cool. Watching for potential midday snow squalls today, as well as the potential for a few bigger storms this weekend and beyond. Decent snow squall blew through here, dropping 1/4" in 5mins. Winds gusting to around 30mph. Yet another very warm sunny day. I mean where the heck is winter ?? Our average high in early February should be high 50's. Small front comes through tonight. High tomorrow of 50*, cloudy. Low near 40*. Slight chance of a shower on Saturday, then it leaps back in to the high 70's. Enough already. This has been one of our worst winters on record thus far. January officially featured the highest number of above-freezing lows on record of any year back to the 1800s. Also the 5th least snowy winter on record so far. I'm still holding out hope we can score in mid/late February or March. The -ENSO winters often throw late season surprises at us, including recent ones like 2013/14, 2010/11, 2008/09, and 1999/00. 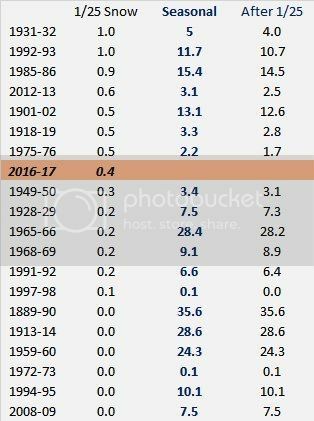 I think you met 98-99 where we got a couple late season events 99-00 happen in a two week span in mid to late january. Yes, thank you. Not sure how I fooked that up. The blizzard of 2000 is my first "epic" childhood snow memory. My first real winter memory is (I think) the January 1999 ice storm. I was seven years old for the blizzard of 2000, and I remember standing out on our driveway in a trance, watching clouds of snow blowing off all the yards and roofs, and standing in the "snow tornado" that forms next to our porch during NE winds. I'll never forget the disorienting feeling I got with the near zero visibility. Speaking of visibility, the one reason I rank last year's blizzard behind the snowmageddon storms is due to the lack of strong winds. We had a few gusts to 45mph midday, which is actually weaker than the *sustained* winds during snowmageddon2, and weaker than the 55+mph gusts during snowmageddon one. We gusted to 68mph in snowmageddon part 2. Easily my favorite storm of all time. So crazy how it puked snow from 8pm to 1AM before flipping to freezing drizzle with nothing showing on the radar..everyone calling bust, etc. Then once the ULL came over the mountains, that squall line of snow-thunderstorms developed over Winchester VA and roared in here with severe thunderstorm conditions, and then everything filled in right behind it so we got to experience 12hrs of something reminiscent of a true Midwest style blizzard. This winter so far go's up there with the tottel crapters like 2001-2002 2011-2012 hopefully we can still sneak in event or two later month or march.today's my Birthday by the way. Had some strong downslope gusts last night as the dry front moved through. Moved some furniture around on the deck. You know you're having a pathetic winter when a morning low of 22F in early February (only 3F below average) feels chilly. this winter has been worse than last winter at least last winter we did have some note worthy events in between the record warm there is nothing pretty much of anything to note worthy this winter funny that we were saying last winter how it couldn't get worse and it got worse this winter lol.seriously those you got to think things will be balanceing them selfs out eather next winter or the following one and with the solar minimum and solar winds weaking you have to like the chances of some kick but winters coming back in the next few years.and of course what cycles 25 and 26 do in the 2020s and 2030s and beowed perhaps this is Phil really the calm before the storm.